What to consider before adopting a family pet. From Lassie to Rin Tin Tin, Black Beauty to Garfield, companion animals in Hollywood and reality play an important role in our lives. Our animal companions offer unconditional love, joy, loyalty, devotion, forgiveness, friendship and compassion. Animals amuse and entertain. They comfort and console. Their presence is soothing and therapeutic, and the mere act of petting an animal calms us down. According to numerous studies, pets can decrease people’s blood pressure, cholesterol and even triglyceride levels. Pets improve our heart rate and decrease loneliness, anxiety, depression and fear. Enjoying the company of animals also builds people’s resistance to disease. In sum, pets improve our emotional as well as spiritual health and well-being. They enhance the quality and longevity of our lives. And for many of us in this technological age, our animal companions are our primary link with the natural world. As such, pets help us to recognize what is truly important in life. There is nothing synthetic or manufactured about animals— they are genuine creatures without pretenses and, in turn, they allow us to be who we really are without judgment or blame. Through the companionship of pets, we come to accept spontaneity rather than dwell on the past or fear the future. Pets teach family members much about life and death, illness and infirmity and the aging process. 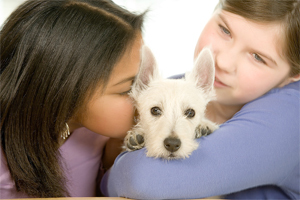 Caring for pets also teaches family members a great deal about selflessness and compassion. The decision to adopt a pet is life changing and, in many ways, similar to adopting a human child. The emotional and spiritual bonds forged between a family and its new pet are powerful and profound. The pet will likely be regarded as a beloved family member, and requires loving care from the beginning of the relationship until the animal’s inevitable death. The pet will share many of life’s significant events and occasions with his new family, as well as the daily tasks, routines, vacations and holidays the family experiences. Before adopting an animal and becoming a “pet parent,” consider the obligations associated with incorporating a pet into a family’s life and home. Do you or another responsible family member have time to take good care of a pet each and every day of the pet’s life? Do you (and your partner) work long hours away from home, leaving the pet to his own devices and potential destructive behaviors? Are you able to provide a comfortable and safe environment for your new pet? No matter how much your children want a pet and proclaim their willingness to care for it, are you prepared to supervise and assume the ultimate responsibility for the pet’s well-being and care? Are you prepared to provide a pet with a healthy space to sleep, nutritional food and regular exercise? Do you have a budget that can accommodate the spaying and/or neutering of a pet, vaccinations, veterinarian visits and proper dental care, grooming costs, toys, crates, bowls and accessories the pet requires? When you leave town for business or pleasure, do you have a reliable and safe place to board the animal or a person to serve as a pet sitter and caregiver? Do you plan to take your animal companion with you on vacations? If so, you must make certain that the pet is welcome and well-accommodated, whether by hotel, motel or friends and relatives with whom you may stay. Can you afford prescriptions and other medications for your animal if the need arises? You must be aware your animal is as susceptible to illness, injury and accident as humans are. Before adopting a pet, make certain he is in good health by having a reliable veterinarian check him thoroughly. In addition, conduct careful research and study the characteristics and demands of the animal you are considering. Read literature and Web sites pertaining to the type of animal you desire, and how much care and attention this pet requires. Couple this consideration with how much time and energy your lifestyle permits to accommodate these needs. Discuss the adoption thoroughly with your immediate family members and ensure each person in your home understands his or her responsibilities in regard to caring for the new pet. Consult with your family members, friends and acquaintances who may have a similar pet, along with a local veterinarian whom reliable contacts have recommended to you. Find as much information as you can about the amount of time and money required for the care, training and socialization of the pet you are considering. Once you have decided whether to buy an animal from a reputable breeder or to save an animal’s life by adopting a pet from a shelter or rescue organization, prepare your home for the new addition. Puppy or kitty-proof your home by removing potential health hazards and instructing children to be gentle when holding and interacting with the pet. The need for kids to be careful, kind and compassionate should be heavily emphasized and enforced. The adoption of an animal companion should never be made in haste. Careful thought, consideration and research are the prerequisites of sharing a long, healthy, happy and rewarding life with a loved animal companion! About the author Diane Pomerance, Ph. D.
Diane Pomerance, Ph.D., is the author of six highly acclaimed books and numerous articles. Pomerance is an internationally recognized pet expert who has been interviewed on countless radio and television programs, as well as in newspapers and magazines.